Swoodson Says is having a fun series about how to hack up your favorite patterns to use as the jumping off point for a Halloween costume. I loved this idea and immediately wanted to be part of it. If you haven’t been following along, then you’ve missed out on some great hacks already. But never fear…. it’s the internet so you can go back now and catch up on all the Halloween inspiration! Bean has started getting really into the Disney princesses, and Jasmine is by far her favorite. I mean, she likes Ariel too, but when she talks about Jasmine her face just lights up. She’s never even really seen Aladdin, so she only knows her from her books and from Jasmine’s drop in appearance in Sofia the First. But the love runs deep. 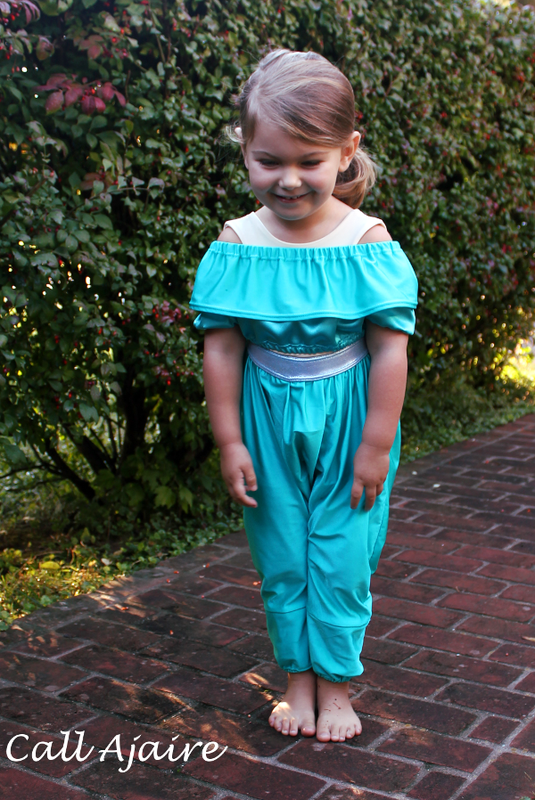 So of course she wanted to be Jasmine for Halloween. 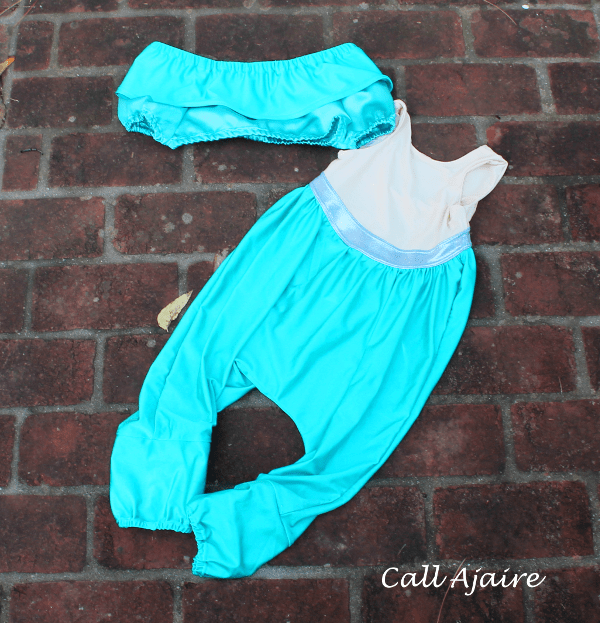 For the basic shape of the costume I used two favorite patterns: the Alley Cat Romper (*affiliate link) from Lil Luxe Collection and the Free Peasant Dress from Once Upon a Sewing Machine. Since Jasmine’s belly is exposed I decided to use some swimsuit lining fabric I had in my stash on the top of the romper which worked out well. 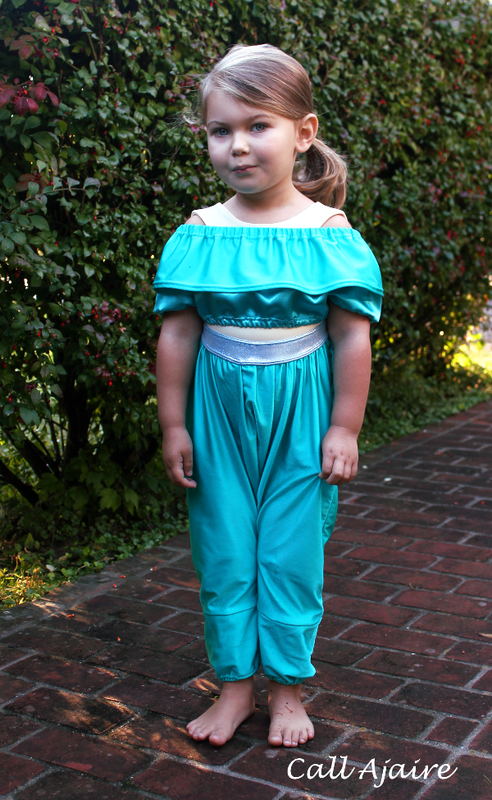 The only real hack to the pattern that I did was to change the curve of the bodice and gathered bottoms to curve down instead of up and I sewed a “belt” to the bodice before attaching the bottoms. The ankles cuffs are also a bit wider and have a channel for elastic for a little more of a Jasmine look. The top is basically a cropped peasant dress with an elastic neckline. I used the short sleeve option and followed the Ruffle Neck tutorial. The top edge was cropped just below the underarm and all of the edges (including the sleeves) have a fold over channel for elastic. I measured Bean around the shoulders, chest, and biceps to figure out how long to make the elastic. Super easy, right? Bean scoffs at how simple this hack was, hehe. Of course, between now and Halloween I’ll add some accessories and probably tweak things a bit, but it’s so fun having her Jasmine costume to play in. 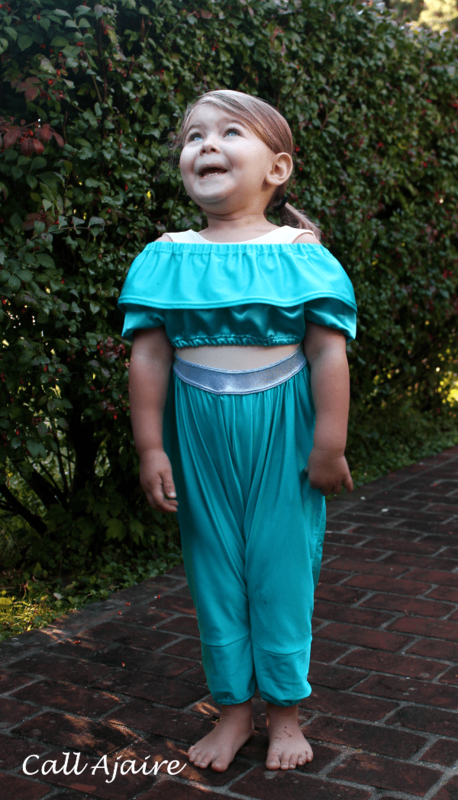 Bean is so excited about Halloween this year and it was really satisfying to fulfill her costume request. And for the rest of you, don’t forget to try out the scavenger hunt Swoodson Says is running (there’s pic to find somewhere on this blog!) and enter the giveaway! The faces this kid makes! omg!!!! I can't even get over how adorable this is!!! now I'm completely distracted from writing my post 😉 ha! Oh how I love this! You did an amazing job with all those details. It's a great pattern, and I thought of it immediately when she said Jasmine!